Origin of Name: Pyro+Roach= Pyroach. *Gives full immunity to all Ground-type moves until hit by a Water-type move. -Note: Rain also causes the ability to fail. The ability reactivates when the sun is out, and prevents the user from falling from Water-type damage so long as the weather stays this way. If the user switches in and out, the ability resets as well. The user releases flames in an uncontrollable fury for two to three turns. It then becomes confused, however. EDIT#2: Added BST provided by ! EDIT(09/07/14): New display template and design! Another long overdue evolution! Pyroach is back with a vengeance! I have no idea why I thought the last design wasn't cluttered to hell with details. The redesign removed a majority of those unnecessary details and turned it into a simpler design, much with its pre-evolutions' new designs. Originally I was going to add some stinger elements to its abdomen and head from this sketch sheet provided to me by UltraPsychic a year ago, but couldn't really integrate them to my satisfaction. So that was scrapped in the final design. Still, thanks for taking your time to provide some sketch ideas, man! Pyroach can be compared to its similarly typed brother, Volcorona. While Volcorona hits like a nuke when it comes to the special offensive, Pyroach here can function a little differently. Instead of simply relying on raw firepower alone, Pyroach can go mixed as well. Its attack stat isn't completely useless likes its moth friend here, and can put it to use effectively. X-Scissor for STAB, or maybe even Flare Blitz if you'd prefer over Fire Blast/Wildfire? Should you had the patience for its previous stage, Catacoal, expect to see some Explosion force in your arsenal too. If you don't decide to go mixed (not everyone likes spontaneous combusting insects apparently), its special attack while not as godly as Volcarona's still packs a wallop! 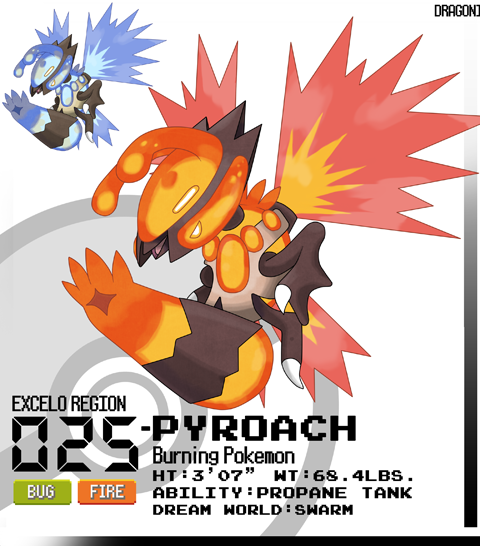 Its hidden ability allows Pyroach to evade all forms of Ground-type attacks so long as it avoids getting hit with Water-type attacks (or if rain's up). Even then, its defenses aren't exactly its strong suit. So if it starts raining, you can be an arsonist another day! Protect your crops, cuz Pyroach is merciless when it comes to harvest time! Just a heads up, that the image isn't showing up. Odd how it's based on ants, bees and wasps (which are all closely related), but its name implies a relation to cockroaches, which are actually more closely related to termites. Okay, a: cute is never coming back, b: dangerous is still here, joined by terrifying and c: why roach and not wasp for the name? why? why isn't this real? Ok, how has Nintendo NOT hired you to design dudes for a Pokemon game?! You have the best designs! Look at this line, the Bunkod line, the Humbeak line, the Glacipus line, the Icylix line, and the list goes on! Can we at least get a fan game in Excelo? So far, it's a nice alternative for a fire type if you didn't choose Tiglaze for the job. This Pokemon may not have much in terms of speed and die in one hit to any rock or fire move, but it'll certainly deal some decent damage if it doesn't get smacked with Stealth Rock first. It isn't exactly slow, but yeah, Stealth Rock is a problem. Pretty much a glass cannon here, though I'd still choose Tiglaze over it. Looks a lot like Hibachi from the Dodonpachi games. Does propane tank protect it from ground hazards as well? It's like Levitate, so yes. how did you make the game logos for jade, marble, and onyx? Pretty awesome! I wish I could draw well enough to actually put together a fakedex. If it was a real pokemon then it wouldn't get any real play due to those stats and ability. Maybe if it didn't receive Rock Damage instead of not receiving Ground damage or maybe not receiving damage from Rock and Ground Type as otherwise its ability just comes of as a subpar Levitate. It has some good special attack, but doesn't have the speed to make it a sweeper or the bulk to make it tanky. I'd say speed would be easier to fix by adding 15-25 points to base speed, something that could be removed from attack. Choice Scarf Wildfire could work, but their better Choice Scarfers out there and since I only use choice scarf as a last resort then this doesn't have much playability for me, but I'm talking as if this were an actually pokemon. Cool design! Saying it wouldn't get any real play is a bit of an overstatement. It may not have speeds on par with other Pokemon, but it can mitigate this issue using Flame Charge / Quiver Dance. Or whatever speed boosting move it can obtain similarly. And its offensive stats while outclassed by other Pokemon doesn't make it any less powerful than how it is atm. I'll think about slightly readjusting the stats, but I'm content with how it is atm. Regarding its ability, I'm still rethinking its concept to not make it an inferior Levitate and give it its own niche. Evading Rock-type moves doesn't really make sense since it, as stated, is meant to function similarly to Levitate. That is true, but to Quiver Dance would waste a turn and it would seem kind of pointless when there would be better bug types to Quiver Dance with. Flame Charge may be more effective, but still with that move's low attack power and that fact that Pyrouch's attack is lower than it's special attack, players wouldn't be getting the best bang for buck by doing that. I thought it a good idea to mitigate some of that attack stat onto speed because generally speaking people don't train the special attack AND attack stat unless that pokemon has really high defenses in cases of a tank or really high speed in cases of a sweeper. With Pyroach having low defenses and average speed I would say the best thing to do would be maximize sp.atk and speed and use it like a glass cannon similar to how Greninja or Sceptile are used. Therefore Attack would be pointless except for that Flame Charge. As it is, rather it's Quiver Dance or Flame Charge a Focus Sash would be a must and while there's nothing wrong with relying on sweeping with a 1 HP remaining the first encounter of the increasingly common priority users or the less common multi-hit move users would instantly shut down this pokemon. All in all with its stats as it is now I would place it in UU or RU, but not quite NU. I would say to make it's ability all its on: make it where its has increased evasion until hit by a water move and the first time it hit by water move it only does regular damage instead of type advantage damage. It's fit with the idea of the hornet which as really hard to hit if I speak from experience. The original idea of it being impervious to rock moves along with ground is because If it comes in on stealth rocks or any other rock move then its as good as dead. That evasion ability change while sounding better, is waaaaay too powerful. Anything that allows the Pokemon an evasion boost is going to be a pain to deal with, especially if it can pack a punch. I'll do something else with it when I get a better idea of how I want the ability to function, but an evasion boost is a no go. As for the Stealth Rock comment, the same applies to Volcarona man. And pretty much any Pokemon with a x4 Stealth Rock weakness. Stealth Rock is an OP entry hazard and neuters pretty much any Pokemon weak to it with massive damage. The name makes no sense pyroach its not a roach its a hornet or bee or wasp at least thats what it looks like to me, no denying it though its badass! Meh. The roach in its name refers to it being a pest, not an actual roach. I don't really have any problems with the name at the moment to be honest. I got the vibe of it being a more powerfull, but less bulky Volcarona, So I gave it stats similar to that description. Also, I like the ability, however I feel it would almost hinder the Pokemon. I would add the stipulation of the ability keeping it's power in sunlight. So if it is sunny it will always remain invulnerable to ground type moves, even after being hit by water. This addition to the ability wouldn't overpower it as weather only lasts 3 turns and water types being so dang common. Of course... It's your fake. Just a suggestion. I can make a move-pool for it too if you like? Well, thing is this Pokemon's found pretty early in the region, so having near Volcorona level distributed stats sounds a little overkill lol. The ability having some additional perks sounds like a good idea though. So, what you're suggesting is as long as the the sun is out, the ability allows allows it to evade falling after being struck by Water-type moves? And if the sun comes up, it can levitate again? And yes that is exactly what I am saying. The reason is, is water Pokemon are really common in the meta game; Greninja, Rotom Wash, Gyrados, Swampert, Etc. Chances are at least one of these will be on any team you battle. Most players would know the ability and immediately use a water move... Leaving you without an ability for the rest of the match. ~Being the same thing, immunity to Ground type moves until hit by Water type move unless it is sunny, BUT I would also have the ability regenerate whenever the sun comes out. ~Cop out and just give it levitate. As this basically does the same thing anyway. It sorta implied it considering its placement on the dex lol. But regardless, I think I'll go with the 1st suggestion. Been waiting to see this one remade. Nice work! I like it, i dont love it because is a bug type. I dont like the bug type, but is a good design and concept. Seems like the temper isn't the only hot thing about it. Stat-wise I'd put it on about Scolipede's level: 65/65/55/115/80/95 = 475. Might need to rearrange it a bit. It should have the option to go mixed according to the description I provided. The total BST however is fine. Ah, seems that bit slipped past. Still, the other spread provided is a lot better than mine.